It was just one of these mornings. Lying there in bed, I felt as if my life was washing over me like a big grey wave, the murky waters were draining off, revealing bit of useless debris. My music and my writing, appeared like mere fragments; ideas lied scattered everywhere; unfinished poems, unsold CDs, unwritten essays. And ideas were just flying around in my head like annoying flies. There were no neat stacks of achievements piled up like thick, leather bound books with gilded letters spelling out that phrase, “a successful career” or a linear path steadily leading up to that throne – let alone camping stool – on which I could rest and from which I could observe my “kingdom”: a well sorted archive full of publications and releases, of awards and chronologically ordered press clippings. I felt messy, insecure, depressed, a bit lonely but most of all irrelevant. I was spending a few days in solitude at my mother’s house in the countryside. The peacefulness was very soothing but my mind can be overactive and therefore stressful at times. I have often said to my husband, “No one stresses me as much as I do myself”. It was still early, so I went for a run, which always makes me feel better. Taking in the soft, luscious countryside bursting with green buds and concentrating on my repetitive breathing soothed me. Back home I had more espresso with hot milk, some toast with honey and promised myself to write for an hour before going on a little Sunday outing to the local art museum. I drove into the village and parked the car just far enough away to enjoy a brief walk up the cobble-stoned street. The weather was beautiful; there was a light breeze, an abundance of fresh air and some wind-shaded spots had been warmed from the sun. Cheerful little puffy white clouds hurried along a light blue sky that created a nice backdrop to the red brick of the expressionistic buildings and the dark green of the fir trees. I entered the museum and my first cursory glance caught some paintings I automatically expected to be 17th century Dutch church interiors. Upon entering the exhibition however, I was astounded to see that these pictures, a few more interiors but mostly still lifes, dated from circa 1968 to 2009. They were by a contemporary Dutch painter Henk Helmantel and the exhibition was to commemorate his 70th birthday. What struck me wandering around, was how tranquil, focussed and simple most of the pictures were. They were mostly fairly large in format. 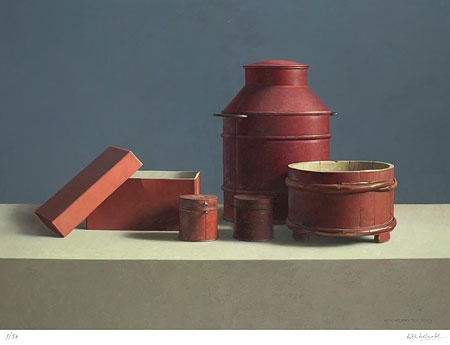 As a viewer I had the feeling that the artist was consciously showing these objects to me, rather than permitting an intimate view of something otherwise quite private. These works were therefore less intimate than their earlier Dutch predecessors. But the choice of objects depicted were very similar. They were all simple household items, bits of fruit and vegetables, nothing exotic but mostly locally grown like asparagus or chestnuts. 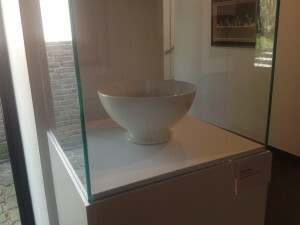 There were simple boxes, bowls and glass vases, some antique, but displayed in a consciously chosen space, in a balanced and symmetrical way and whose clear and clean lines reminded me of Danish art that emerged around the beginning of the 19th century. 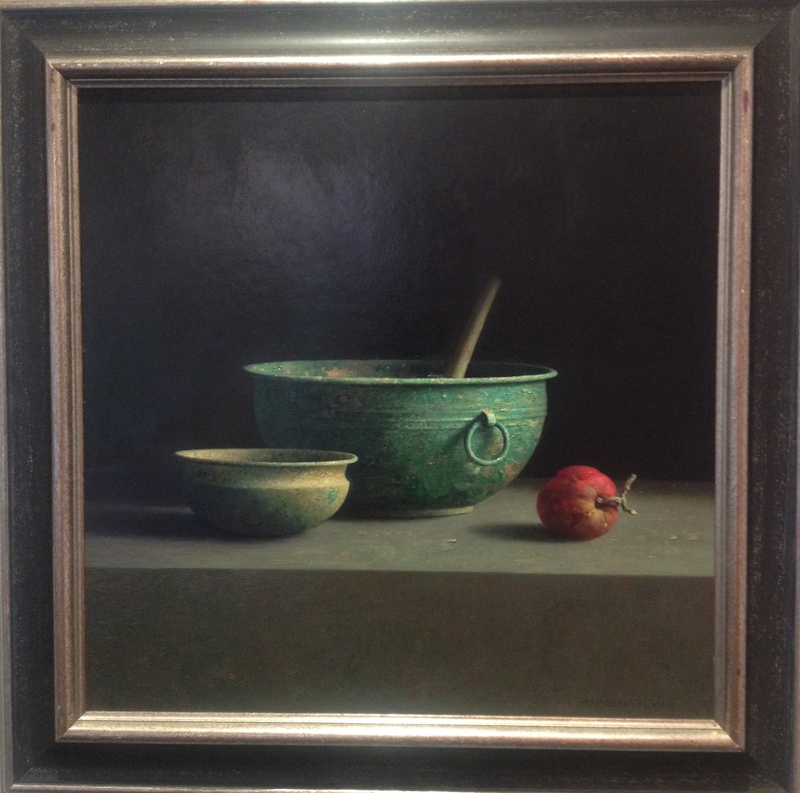 Many items depicted stemmed from the artist’s collection. But there was no highly precious or prestigious aura surrounding them. Their value was based upon, so it seemed, on shape and colour, or their proportions. 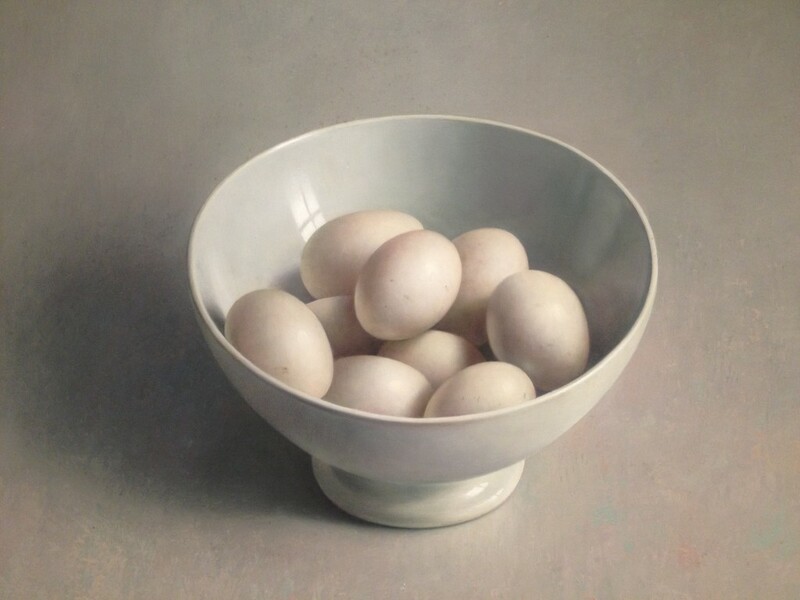 A bowl on a narrow rim, with an even cream glaze, which Helmantel had painted holding nine eggs (see above) was displayed in a glass show case what accentuated its simplicity and serenity. 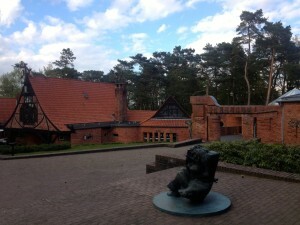 Born in 1945 in Westeremden in Holland, which lies North of Groningen, Helmantel was raised as one of five children. His parents owned a nursery and the children helped selling their plants and flowers at the traditional local markets, like in Groningen. The story goes that on one of these trips Helmantel made his very first visits to a museum and was overly impressed by Rembrandt. From then on he collected any snippets and pictures from newspapers and magazines he could find. He was determined to become a painter, later attending the art academy in Groningen. 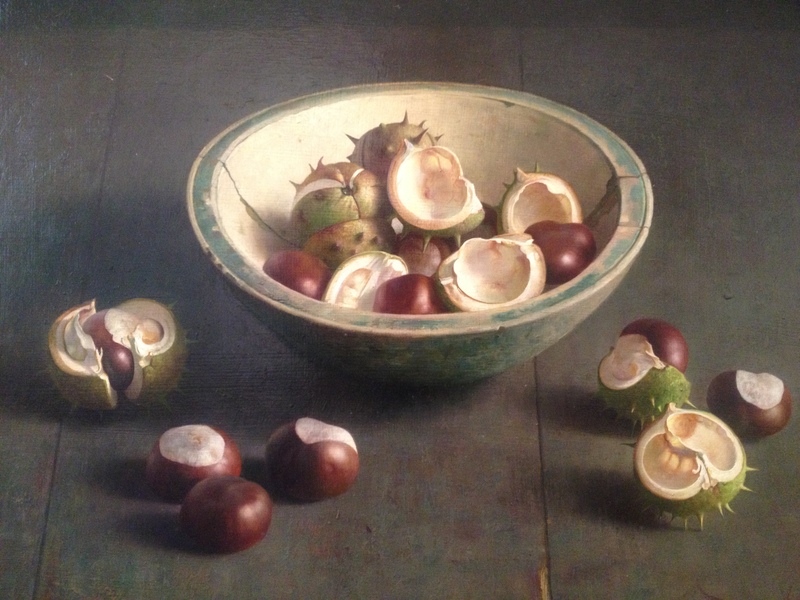 It became obvious to me that he was a diligent and meticulous worker, dedicated to depicting these serene objects in the most naturalistic way possible. He was obviously interested in the unique surfaces of the objects, like in the irregular iridescent glass of his collection of Roman vessels (see picture above). But at the same time, he wasn’t taking any liberties by letting a single brush stroke stand out or have an expressionistic or impressionistic character, let alone by being textural. 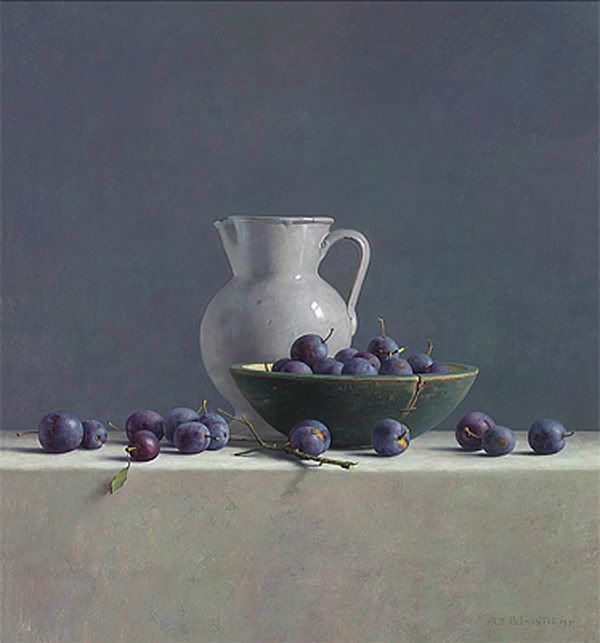 Each stroke serves the depiction of the object in the most naturalistic and realistic way possible. Personally, I love texture and abstraction in painting. I only recently saw a quite impressive exhibition of William Turner’s work at the Getty museum in Los Angeles. But that afternoon, it was the clarity and focus in Helmantel’s paintings that inspired me. 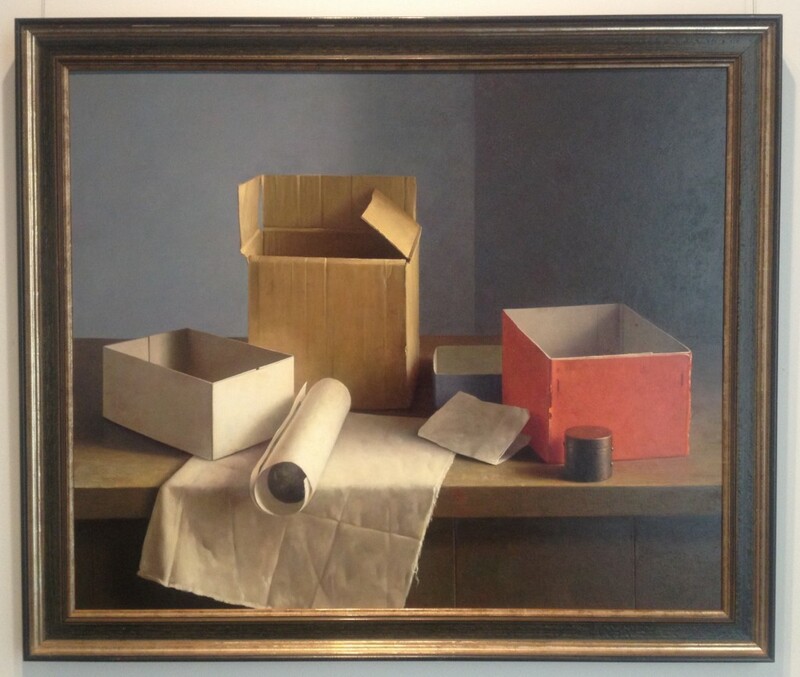 Even his more involved paintings are evenly and thoughtfully grouped objects. There are no coincidences. Everything is consciously arranged which also means that each object is taken seriously within its own unique value. “Take every piece, each poem you write, every song you sing seriously, take it for what it is!”, I told myself. I could feel the jumble in my head and the doubtfulness that tortures every artist more or less frequently being soothed. “Simplify and focus”, I kept thinking, “stick to what you do and do it with dedication, clarity and consciousness”. Previous Post Frances Livings’ Ipanema Lounge ~ New Album Out Soon!